At one point in practicing medicine, I remember worrying that I was becoming racist. I had examined several black children one day who were all uncooperative and fought me, so I couldn’t get in a good exam, which means I couldn’t practice good medicine. I could feel myself tensing up when I went to examine the next kid. And then one day, I examined a white kid who fought me wildly, and immediately after I examined a couple of black kids, a brother and sister. The siblings were a delight. They were engaging, clever, and cooperative. The father became furious with me, grabbed the kid and stormed out of the ER. Apparently, he thought that it was a challenge to his parenting, and possibly his intelligence. After thinking about it, I guessed that he was possibly embarrassed because at some level, he felt that he should have been teaching his child these things. I started occasionally asking parents if they read to their children. Parents can lie of course, but they tend to tell the truth, with their expressions if not their words. My favorite example was once recently when I asked a child if her parents read to her, and she said, “No.” Mom just laughed in a way that made it was obvious that she read to her all the time. With time, I became more subtle: I simply asked the children what their favorite books were. The correlation is striking. 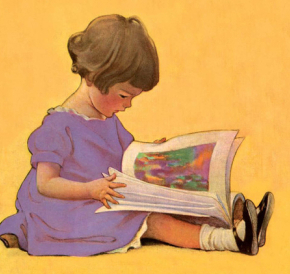 Kids who have been read to are calmer, less fearful, more confident, more trusting, more engaging. I can tell by 6 months of age the children who have been read to. It’s that powerful. Of course, the confidence is probably one of confidence in the world, and likely comes from having a parent who expresses commitment by sitting down with a child regularly and giving her personal attention. The intellectual benefits of the reading per se will appear with time, and the self-confidence and the mental acuity will synergize to empower the child for her whole life. For whatever reason, the parents who come to the ER where I work in Church Point, Louisiana almost all read to their children. Even the welfare moms overwhelmingly read to their kids. It is not like that in most of the hospitals where I have worked. I am told that it has to do with the local school boards, and educational traditions. We’re in Acadia Parish, (remember, Louisiana doesn’t have counties) and from experience I know that you can cross the parish line in some directions, and the difference is striking. In some other parishes, parents just don’t read to their children as much. It makes an enormous difference in the kids and in their lives. I am curious to see where these Church Point kids end up in a few years. I wonder how we might encourage parents to read to their children. Traditional advertising could help. But I have also wondered if it would work to have volunteers who simply go through the maternity wards, talking to mothers, and perhaps giving them a few books. It would move the country and the world forward. 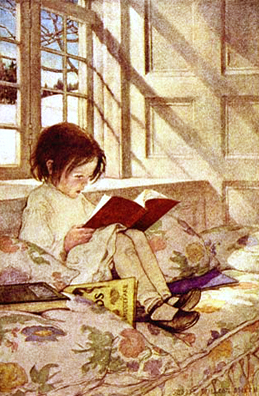 Top: My First Picture Book by Jessie Wilcox Smith. Bottom: A Child’s Garden of Verses by Jessie Wilcox Smith. We Duhons were well read to. One striking memory I have of my son over 25 years ago: we were in the car and on NPR someone was trying to hammer home that parents (the ones who didn’t read at all being the target audience) should read to their kids “just 15 minutes a day”. His face was screwed up and he was about to cry. I asked him what was wrong. He said that if parents read just 15 minutes a day, children would become sad and would behave bad. He went on for a while on that theme. As a nurse who goes to patients’ homes I see in rural Indiana some families on the other end of the spectrum. I really liked this post. it was very good.